At this very moment, can you recall how much you weigh? For some of us, pulling out the scale first thing in the morning has become a bit of a habit. Others look at it after a weekend of feasting, whereas there are still a lot of us who only really pay attention to our weight when we go in for a doctor’s appointment and have to stand on a scale so they can record how much we weigh. Jumping on that scale can help us feel like our workouts and healthy eating habits are paying off, but is this the most accurate way to determine whether or not we’re healthy or truly losing body fat? We may equate our weight with how fat we feel on any given day, but how accurate is this reading? Turns out, not that accurate after all when used independently. For example, if your workouts have consisted mainly of exercises like strength training, the number on the scale might be higher even though your jeans no longer feel so snug. That’s because muscle weighs more than fat. Keep in mind that not all fat on our bodies is bad. We actually need body fat for both sustenance and health. But there are different types of fat in our bodies. “Body fat is one element of body composition, or the proportion of fat, muscle, visceral organs, and connective tissue that comprise an individual . . . the latter three are often referred [to as] ‘fat-free body mass,'” Dr. Rusha Modi, MD, MPH, and assistant professor of medicine at USC, told POPSUGAR. This is why calculating our body fat percentage has become more popular. Body fat percentage basically determines “how much adipose tissue or fat you have relative to your weight,” Dr. Modi said. We calculate our body fat percentage by dividing our body’s amount of fat by our total weight. 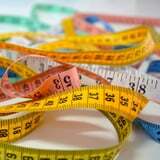 BMI – Body mass index includes understanding your bodyweight as a function of height. It’s easily calculated but imperfect because it doesn’t differentiate fat versus muscle weight. 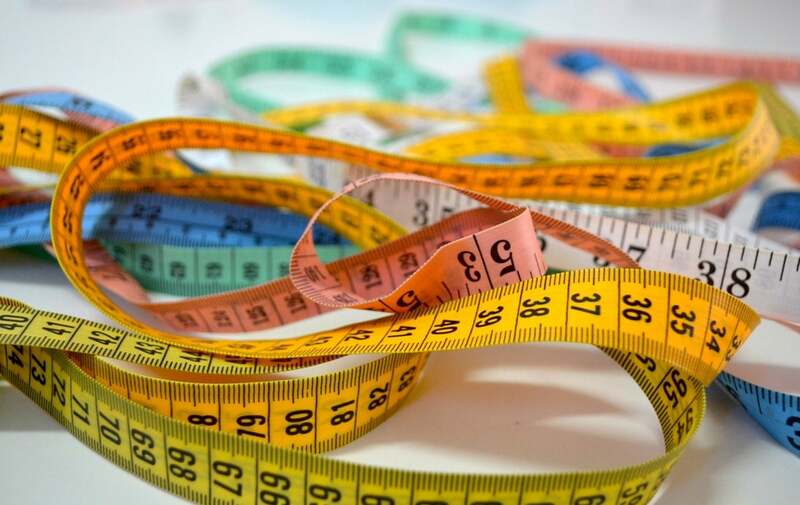 Waist circumference – Determining your waist circumference is a good measure of truncal weight, but not everyone carries fat here. Calipers – Calipers are used on skin fold thickness at various sites around the body to determine fat percentage. This method is simple to use but doesn’t directly measure fat percentage. As one’s BMI increases, this becomes harder to use because it is not always easy to pinch the skin. Bio-electrical impedance – You may have seen these white handheld devices with metal plates on the sides in your local gyms or on some new fancy scales. This device sends a safe amount of electrical current through the body. The amount of resistance is used to determine how much fat you have because fat carries more resistance than muscle and water. Of course, fluid shifts can occur for a variety of reasons, such as hormones, ambient temperature, dehydration, etc., so this method is not always accurate. Dilution method – People drink isotope labeled water and give body fluid samples. The isotope levels correlate with fat mass. DEXA scan – This scan uses X-rays to pass through different parts of the body at different speeds, which can then be used to determine body composition. CT/MRI scan – This is the most accurate formulation and can assess the difference between visceral and subcutaneous fat as well as measure fat-free mass. However, this method is very expensive, and these machines generally are not portable. Underwater densitometry – With this method, people are submerged in a water tank. Fat is more buoyant than muscle or bone, so relative buoyancy indicates more fat. This is time-consuming to do and is typically only used in clinical studies. However, it is very accurate. Air displacement plethysmography – This metric is similar to the water method, but a person is put in a chamber filled with air. While this method is very accurate, it is also expensive. While there is no exact number that is right for everyone, there are ranges people should find themselves in when calculating their body fat percentage. The American Council on Exercise (ACE) suggests the numbers do vary based on aspects such as physical activity. Female athletes can be between 14 percent and 20 percent, while male athletes can have six percent to 13 percent. Similarly, ACE also has a “fitness” category, ranging from 21 percent to 24 percent body fat for women and 14 percent to 17 percent for men. Also, 10 percent to 12 percent body fat percentage in women and two percent to four percent in men is considered acceptable, while 32 percent or more in women and 26 percent or more in men is considered obese. As you can see by the numbers, a woman’s body fat percentage is supposed to be higher than a man’s. That’s because “women need a higher percentage of body fat in order to maintain their reproductive health,” Dr. Modi said, adding that “‘good’ body fat percentage is relative [because] one number in isolation needs to be supported by contextual information,” such as medical or health conditions. Figuring out your body fat percentage may help to understand your risk of disease, now or in the future. However, the science behind health, weight, and body fat percentage is “nuanced and evolving,” said Dr. Modi, who stressed that more research needs to be done to determine “good” body fat percentages and that people should not rely only on those numbers to determine how healthy they are. Instead, professionals like Dr. Modi use body fat percentage in conjunction with “a global evaluation of someone’s health” by taking into account their blood pressure, cholesterol, muscle mass and strength, Vo2 max (which is a measure of aerobic capacity), waist-to-hip ratio, and measurements of disease-specific markers like blood sugar levels as well as hormonal evaluations.